The fate of a tree planted at poet Emily Dickinson’s home raises questions about whether gardeners can — or should — play a role in helping plant species migrate in the face of rising temperatures and swiftly changing botanical zones. On rare occasions, the townsfolk of Amherst, Massachusetts, would catch a glimpse of a ghostly figure dressed in white, leaning over to tend her flowers by flickering lantern light. The mysterious recluse, who was better known to neighbors for her exquisite garden than for her lyric poems that revealed a passionate love of nature, differed from fellow 19th-century American writers whose thinking became the bedrock of modern environmentalism. While Thoreau famously declared wild places to be “the preservation of the world,” Emily Dickinson was finding nature’s truth and power in an ordinary dandelion. Among the plants that survive on the family property where Dickinson confined herself for much of her adult life are picturesque old trees called umbrella magnolias (Magnolia tripetala) — so named because their leaves, which can reach two feet long, radiate out from the ends of branches like the spokes of an umbrella. Ironically, the denizen of the Dickinson homestead is also challenging basic precepts of conservation practice, such as what is the definition of “native”? Are climate refugees that hitchhike north via horticulture less worthy of protection than plants that arrive on their own? Do they pose a threat to existing native species? Should native plant gardening, the domestic form of assisted migration, be used to help plants stranded in inhospitable habitat? The standard definition of native, says Bellemare, was based on a view of nature as unchanging, and of what constitutes “native” as absolute and enduring. But “this very local definition breaks down,” he says, as climate change makes many plants unsuited to habitats they historically have occupied. The definition of native needs to shift, he adds, as the boundaries of entire biogeographic regions, like the eastern deciduous forest, shift with changing conditions. A few years ago, Bellemare began to notice umbrella magnolias “peeking out from roadside vegetation” in western Massachusetts. A new, more nuanced set of terms than ‘native’ or ‘non-native’ is needed,’ says one biologist. Most of the naturalized plants, he observed, were “close to, or within sight of, horticultural specimens.” Intrigued, he set out to determine the age of the garden escapees. Although some of the landscaped trees, like those on the Dickinson homestead, were planted more than a century-and-a half-ago, core samples from a number of the largest naturalized individuals revealed that the species started escaping profusely only in the last 20 to 30 years. For years, scientists have predicted that natives planted well north of their historic geographic limits inevitably would not only survive, but thrive and naturalize outside of horticulture in habitat made increasingly hospitable by global warming. In a 2008 paper in Frontiers in Ecology and the Environment, biologists found that 73 percent of the 357 native European species they investigated were being sold hundreds of miles north of the plants’ natural geographic ranges. “While debate continues about whether humans should actively assist the migration of species in the face of climate change, it is clear that the horticulture industry has already done so for hundreds of species,” they wrote. Natural range shifts of birds and other mobile species have been documented in the past decade, but new studies suggest that many native plants are also struggling to keep up with climate change by migrating to higher elevations or towards the poles. In an analysis of the flora of Worcester County in central Massachusetts in 2013, biologist Robert Bertin found that the ranges of native plants appear to be contracting. “Northern” species most widely distributed in upper New England, he wrote, are declining faster than the region’s “southern” plants, primarily from New England’s lower reaches, which are expanding their ranges northward. In a paper published earlier this year, biologists detected significantly fewer shifts in elevation by plants in California than by other organisms such as birds and mammals. They also found that the migration upward in elevation of non-native invasive plant species was nearly five times greater than that of the flora overall, and even more when compared to localized endemic plants. Endemic plants with small ranges, scientists believe, are among the species at greatest risk as their preferred climate shifts far beyond their ability to disperse. Bellemare and University of Minnesota biologist David Moeller have analyzed the likely impact of climate change on one of the most celebrated clusters of endemic plants — herbaceous wildflowers of the Southeast, from bleedinghearts to trilliums — which produce a flamboyant explosion of blooms that carpet the forest floor in spring. These endemic wildflowers have been unable to disperse northward in the 15,000 years since the last ice sheet began receding. While they would probably be well positioned to survive the climatic cooling of another ice age, the breakneck speed of current warming seems to place many of these plants “on the wrong side of climate history,” Bellemare has written. Horticulture has helped the umbrella magnolia disperse beyond its former range limit south of the glacial boundary. Naturalized populations have been discovered throughout the Northeast, including on Long Island, where the trees were planted widely in the 1920s, and perhaps earlier. The population located a stone’s throw from the Dickinson homestead, consisting of several hundred trees spread over six or seven acres, is believed to be one of the largest clusters in the Northeast. Not all biologists are toasting the plant’s arrival in the northeastern U.S., however. Because the umbrella magnolia arrived via horticulture, Bill Brumback, director of conservation at the New England Wild Flower Society, says he would not consider it native — the basic prerequisite for a plant worth preserving. “I really don’t know” if southeastern species that have escaped from cultivation should be considered native in New England, says Brown University biologist Dov Sax, who is collaborating with Bellemare and other scientists on a nationwide study of what shifting ranges portend for the survival of native plants in the face of rapid warming. “A new, more nuanced set of terms than ‘native’ or ‘non-native’ is needed,” Sax says. in contemporary conservation science and has fueled concern among some scientists over gardeners moving native plants well beyond their current boundaries. “Native plant horticulture is giving us some fascinating insights into what is likely to happen with climate change,” says Bellemare. “But we’re not at a point where most botanists and ecologists would feel comfortable advocating” that gardeners help protect plants by moving them to cooler climes, he adds. Indeed, given their rampant spread, Brumback worries that the naturalized magnolias may be in the early stages of biological invasion. “If I saw them taking over a woodland, I’d recommend removing them,” he says. Brown University’s Sax suspects that this is unlikely, noting that studies indicate a species’ risk of becoming invasive increases with the distance of its historic native range from the region it is colonizing. 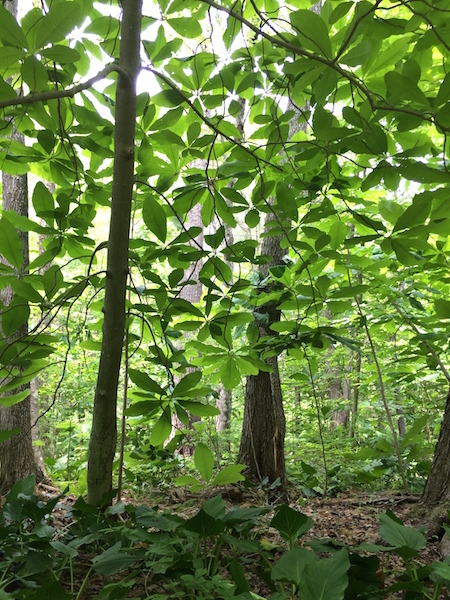 Although he is concerned that a small percentage of plants introduced from other continents “will likely become problematic,” he believes that a nearby native like the umbrella magnolia, which has outlier populations in southern Pennsylvania, “poses little risk” in New England. Both Sax and Bellemare have pointed out that the threat of negative ecological consequences is likely lessened by the fact that the umbrella magnolia and other forest plants from the Southeast and mid-Atlantic share a biogeographic history with those in New England. When viewed in the context of this larger time scale, they suggest, many climate refugees are simply ancient natives returning home. According to paleoecologists, as the climate cooled and glaciers expanded during the Pleistocene era, forest plants of the Northeast survived by migrating to so-called refugia in the South. When the climate warmed and the most recent ice sheet receded, some species were able to recolonize the habitat they had lost. But others, Sax suspects, were impeded by the human-driven extinction, about 12,000 years ago, of the mastodons, giant ground-sloths, and other megafauna that had dispersed their seeds for millennia. “If we still had those big mammals,” says Sax, it’s likely that “many species that are currently restricted to the Southeast or mid-Atlantic would now be in New England.” One of these species may be the umbrella magnolia, which has no apparent modern seed disperser, biologists and horticulturists say, with the notable exception of humans. While scientists grapple with the implications of escaped magnolias, there is poetic justice that a plant from the Dickinson homestead has sparked the discussion. Although the view of enduring wilderness championed by Thoreau and John Muir came to dominate conservation thinking, Emily Dickinson, who perceived the beauty and destructive capacity of nature all around her, may be the more appropriate literary icon for an age of climate disruption. This story is reprinted with permission; it originally appeared on Yale Environment 360.